Happy Motivational Monday, Friends! I had a great week, and I'm very proud of myself for sticking to Weight Watchers while I was in St. Louis. There was a lot of food that I was tempted to stuff myself with, but I made the best choices I could; and I even allowed enough points to splurge on a piece of cake for dessert Thursday, and some drinks on Friday evening. When I got home and weighed myself, I hadn't gained a single pound (I hadn't lost any either, but I am happy to have maintained!). I don't think there is anything I would have changed about how I handled the food situation in St. Louis, so that makes me feel good. Today, I had a great run! My physical therapist gave me the okay to run a mile without doing the run/walk intervals, so I built that into my three-miler today. I decided to run/walk (at a 2:00 run/0:30 walk) ratio for the first mile, then run the second mile at an easy pace, and then do the run/walk again for the third mile. I definitely feel like my cardio is improving a little, because it wasn't quite as hard today. My split times were not my best, but I'm okay with that. It's kind of interesting how similar the splits are whether I'm run/walking or just running. My splits were 11:10 (run/walk), 10:35 (run), and 10:53 (run/walk) today. I am very happy that I didn't feel so much as a single twinge where my stress fracture was, so hopefully that means the therapy is working. I'm going to continue to follow my PT's instructions, so that I don't get injured again (fingers crossed). Andréa recently completed her first half-marathon! She did the Twin Lobster Half, and her goal was to finish under 2:20 (her best time in training). She crushed that goal, finishing in 2:16:52! The coastline course was beautiful, and she felt great throughout the race--even saving enough energy to finish strong. She said the best part of the day, however, was watching her five-year old son complete the one-mile race in 10:39! She loves seeing him learn healthy habits and enjoy being active. She sets a great example for him, as she has lost 75 pounds since August of last year, and started running. Her 5K time has dropped from 38:46 to 28:57! Roxanne completed the Grandma's Half Marathon in Minnesota last weekend! Her goal was to run the entire 13.1-mile distance, and to finish in less than three hours. She crossed the finish line in 2:57, beating her goal by three minutes! 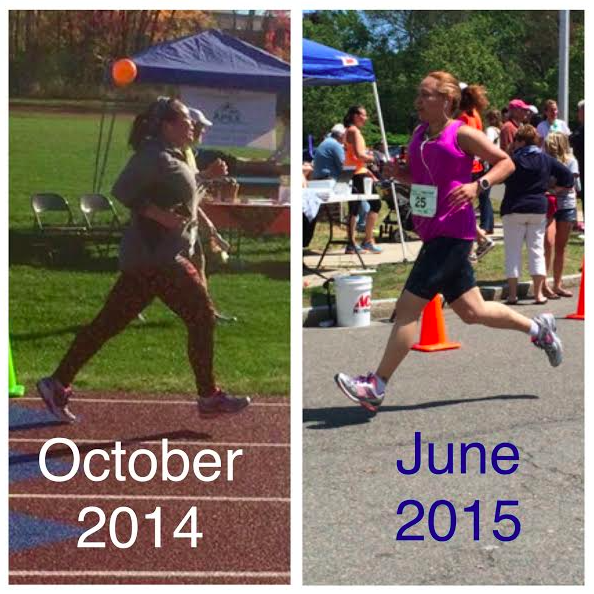 This was her first half-marathon, and she just started running about two years ago. Don't forget to share your own accomplishments from this week on the Motivational Monday Facebook post. Congrats ladies! I feel like when you say your times are "not very impressive," you're then being really condescending towards the people you feature in motivational monday. Dont forget where you came from-- at some point, your current splits were a goal and eventually a big accomplishment for you too! Katie - your ability to handle the rude anonymous posts you sometimes receive is always inspiring to me. I searched this post and didn't find you saying that your run was not that impressive, so I don't even know what they were talking about. Awesome! I'm always so pleased when I'm able to stay on track with WW when I have an event or something where there is lots of tempting foods. I'm sure you already subscribe to Runner's World, but I am (finally) catching up and noticed their lead story for March 2015 was all about hips and how they can affect running and may cause injuries and it reminded me of you! My hips have been really bothering me lately, so I'm going to try some of the exercises mentioned, and some of the ones you mentioned too! I just thought you might find it interesting. Your PT seems be doing the trick!! Good job on staying on goal while traveling. It is so hard! Great accomplishments, ladies! Katie, way to go with staying on track while you were traveling--you rock!